How can you support yourself through anxious periods? Anxiety is a perfectly normal response to stress but when it starts to interfere with your daily life it’s important to do something about it. 1.Pick Passionflower – A herb known as a mind calmer and mood booster and has ‘strong evidence ‘ of being an effective modern-day treatment for anxiety symptoms and disorders. It’s recommended to take 45 drops of a liquid extract daily. 2.Chamomile – a calming herb with a long history of reducing symptoms in patients with anxiety. You can either drink the tea I recommend the brand tea pigs which use whole chamomile flowers. Or a supplement 220-1500mg/day of chamomile extract. 3.Opt for amino acids – research suggests that supplementing the amino acids L-lysine and L-arginine together appears to reduce both state anxiety (temporary anxious feels arising from a situation) and trait anxiety (a general tendency to be anxious) in healthy men and women subject to stressful situations. 4.Cut caffeine – even small amounts of caffeine can exacerbate symptoms in anxiety sufferers. Note: Alcohol and smoking are also well known for contributing towards anxiety and best avoided. 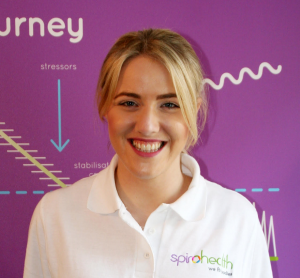 Check out Spirohealth where I work on restoring posture to the spine, I think you will find some interesting information on how posture can affect anxiety levels too. This entry was posted in Client Authored, General Health and tagged alcohol, anxiety, caffeine.